Our customers say “made to order” knit is rare and great. 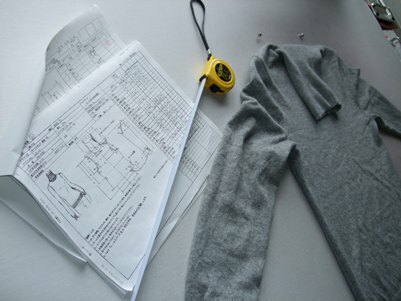 A sweater is usually made of 5 pieces: front body, back body, right arm, left arm, and collar. 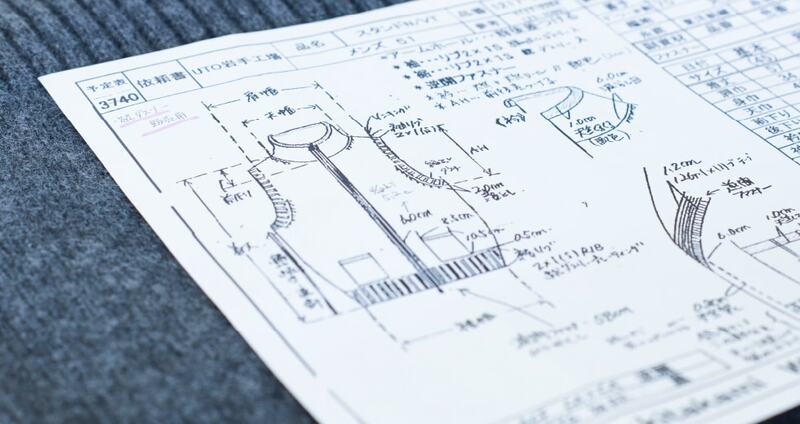 A design pattern is used to make each piece. UTO’s knitwear is made by a “full fashioning” process. Unlike cut and sew knitwear in which the knit fabrics are cut based on a certain pattern and then sewn together, “full fashioning” is a process of shaping a knitted structure by increasing or decreasing the number of needles. This way, the individual pieces are more precisely engineered so that each garment piece is made with no extra fabric. When putting on your turtleneck pullover, you may wonder, “Isn’t the neck-hole too small?” But usually, the neck-hole of knitwear is made to expand and contract so you have no problem putting your head through it. To make it flexible while at the same time keeping its shape, linking is the key. 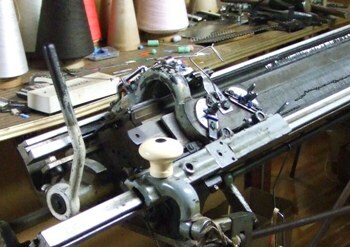 Linking is a method of seaming/attaching pieces of a garment together after the pieces have been knitted. 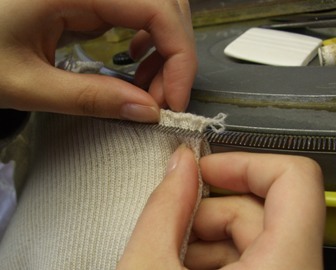 In the linking process, each stitch of the knitted parts to be connected is hooked onto a needle one by one. A stitch can easily be missed, and the result can be disappointing. What’s worse, the mistake is almost impossible to undo. Therefore, the linking process requires a high level of craftsmanship. There are two types of linking machines: machine-driven and hand-driven. UTO uses both types. The hand-driven model is named “Yasumi,” after its Japanese inventor. This machine is light, compact, and works without electricity, so it was suitable for Japan’s small manufacturers in the past, and it still works great today. When a sweater is knitted, the body is knitted from the bottom and the sleeves from the cuff. For example, the front body of a woman’s sweater is knitted with a double stockinette stitch for the hem and then changed to a plain stitch. The waist is shaped, so the number of stitches is carefully decreased to create a curve. The angle of the curve is adjusted, carefully reducing one stitch per five rows or six rows, etc. The back body is knitted similarly, except the shoulder line needs to be angled. Sometimes you don’t know which side is the front of your turtleneck sweater, but if you find a line on the shoulder, it’s the back. The line is set not on the top of the shoulder but near the shoulder blade so that the shoulder line will not be bumpy when you wear a jacket over it. If there are any mistakes in the stitches, theoretically that part could be unknitted, but the hem and cuffs are difficult to fix. If the sleeve or body length has to be changed, then it has to be knitted all over again. Also, it has to go through the fulling process. Fulling makes yarn loose and therefore fluffier, but it makes it more vulnerable to pulling. Once yarn is fulled, replacing or adding parts is almost impossible. Each part of fully fashioned knitwear is made of a single thread, and there is no waste (so nothing is cut off). Since cashmere yarn is ten times more expensive than regular wool, we do not want to produce any excess. It is also eco-friendly that we do not waste any resources. Many people alter their woven clothing, such as suits. They shorten the sleeves or let out the waist half an inch or so. Knitwear is relatively flexible and stretchy; that may make up for a small size difference. However, if the size is off by more than an inch, it will not look good. Since alteration is not an option for knitwear, we decided to take custom orders. We are one of the very few knitwear companies that specialize in made-to-order products. To make our products fit different sizes, we just have to make them one by one. To lengthen the body, you may think rows could simply be added, but the waistline is curved, so the pattern needs to be redesigned to keep its lines and shape. Changing the bust width is even harder. It needs to be adjusted along with the shoulder width, sleeve width, armhole position, and sleeve length. It is a time- and energy-consuming effort close to that of full custom designing. Unlike mass-produced clothing for which you can make several prototypes in advance, our made-to-order products are always a one-shot thing. We are happy to take other custom orders such as for lengthening the collar of a turtleneck, adding ribbing on a cuff or hem, partially changing color, or making an original color mix. We will have to ask you to pay for the price of yarn and the redesign process for some changes, but we will try to cost you as little as possible. The average fee for alteration is around 50 USD, and it is usually completed within a few weeks. We take great pride in creating knitwear that’s made to suit your preferences and figure.